Pourable Dressing, multiple uses. 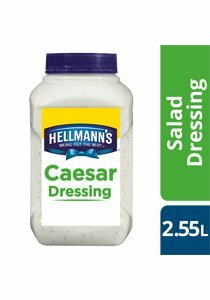 HELLMANN'S Caesar Dressing delivers classic Caesar flavours, loaded with real grated parmesan cheese and finished off with hints of garlic, anchovies and spices. Consistency; saves time and provides excellent cost control. Seven varieties ensures there is good range of flavours to suit every menu and customer taste. Highly versatile, ideal for multiple applications.